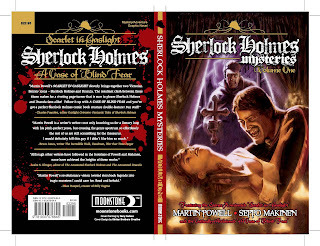 SHERLOCK HOLMES Mysteries Coming Soon! Due in stores very soon! 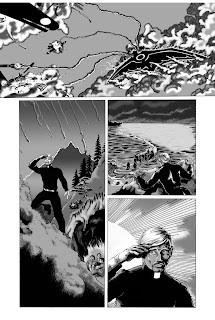 A couple atmospheric grey-toned preview pages (minus dialogue) of my second Black Angel episode, strikingly illustrated by artist Ver Curtiss. 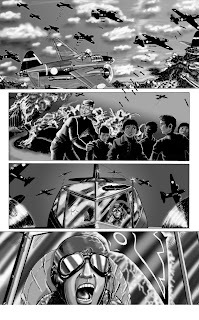 This will be featured in Moonstone's AIR FIGHTERS # 2 comic book anthology. I love writing this series! Congratulations to Robert Downey, Jr. as Winner of the Golden Globe Award for his brilliant and electrifying performance as the Great Detective in SHERLOCK HOLMES! Richly deserved. Now, how about an Oscar nomination? Yes, I really do think he's that good in the role. The Return of Baroness Blood! 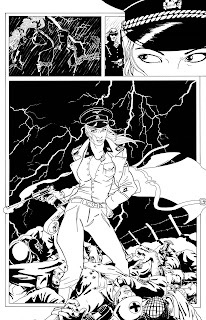 Fresh from the pages of my second episode of Black Angel, appearing in Moonstone's AIR FIGHTERS # 2... the re-emergence of the evil Baroness Blood! 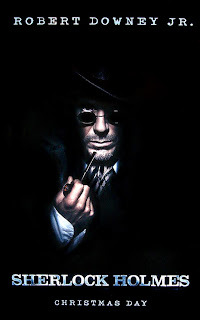 Art by the splendid Ver Curtiss! 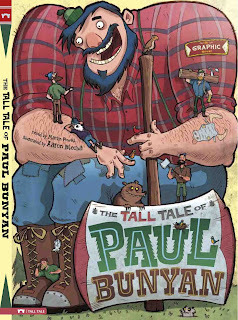 Very exciting day as I just received my comp copies of The Tall Tale of Paul Bunyan, which is now on sale, in gorgeous hardcover library binding and spiffy paperback format, from Stone Arch Books. This book was a joy to write, from start to finish. 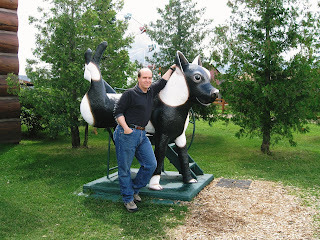 The giant lumberjack, and Babe the Blue Ox, have been favorite characters of mine for as long as I can remember. This is probably the most fun I've ever had being paid to write a book. 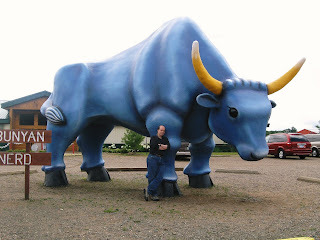 Several other American States lay claim to Paul and Babe, such as Maine, Washington, and Northern California, but as a transplanted resident of Saint Paul, Minnesota--which I very much consider my new hometown--I decided early on that my Paul would be a Minnesotan through and through. 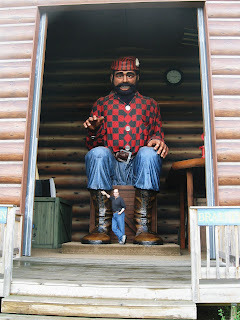 Last summer Lisa and I even made the journey to fabled Paul Bunyan Land, in Brainerd, MN, for the sole purpose of meeting Paul and Babe in person, and to have my photo taken with the bigger-than-life celebrities for the About the Author Page. Although I've always been reluctant to say, I must finally cheerfully admit this is my favorite of the many children's books I've written. It is fabulously illustrated by Aaron Blecha (who also provided pictures for my The Ugly Duckling) and imaginatively edited and designed by Donald Lemke and Bob Lentz. Special thanks to Michael Dahl, too, who continues to help make my literary dreams come true. Whether you discover this book at the library or generously decide to purchase a copy to keep at home on the shelf, I sincerely hope you'll love spending time with Paul and Babe as much as I did. 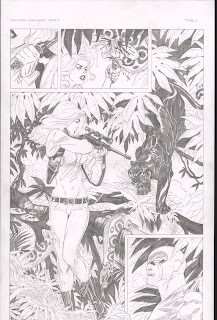 New pages of my THE PHANTOM Unmasked mini-series, by the incredible Hannibal King. 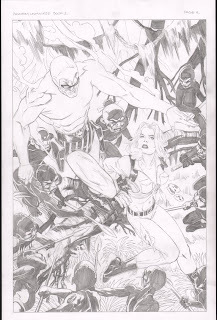 Of course, I may be utterly bias, but I think this is possibly Moonstone's best-looking story ever of the Ghost Who Walks.